Traditional mining has been the backbone of many local Ghanaian communities for centuries. Traditional mining was under the firm and strict control of local kings and chiefs who were the custodians of the land. It was done by digging pits, tunnels and sluices by hand and simple tools without or with less chemical use. Miners, both local and foreign, paid taxes to these local authorities. That placed gold mining under the direct control of the local people. It was jealously guarded and the trade was passed on from one generation to another. Proceeds were of traditional and economic significance. It was a great means of obtaining decent livelihood long before the advent of the Europeans on the Gold Coast. However, with the advent of foreign involvement in illegal mining, there is upsurge in the use of capital intensive equipment like Chang fans, excavators, dredgers and pillagers. The picture changed with the emergence of the culture of greed and avarice as a new and strange culture emerged that suggests that honest and humane acquisition of wealth is backward and foolish. We’ve sold our conscience and for that matter our destiny to greed and Mammon. Profit motivation is the major justification and push factor in life today and not the collective good of society of mother Ghana. 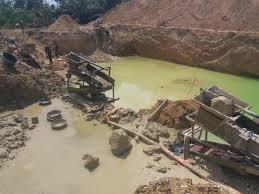 Upsurge in illegal mining activities calls for stricter regulations and bye-laws but carefree and greedy attitudes of the average Ghanaian has made nonsense of any control mechanism. Mining accounts for over 2% of Ghana’s GDP and employs over 1% of the labour force but the overall impact of mining activities is indescribable and devastating in terms of human capital, the environment and health hazards. Over one million people are directly involved in the illegal mining trade and even more are involved indirectly. According to a UN report on mining, every one miner affects about six other lives on the average. Health hazards posed by seepage and emission of poisonous chemicals like mercury, cadmium, lead and cyanide into water bodies and farmlands. These metallic and poisonous chemicals have devastating and long term effects on the central nervous system and result in deforestation, degradation and pollution. Illegal mining is extremely dangerous economic activity killing thousands over the last ten years directly and indirectly. A typical example of illegal accident happened on November 12, 2009 at Dompoase, killing 18, including 13 women serving as porters. Similar accident happened in July 2007, killing more than 10 illegal miners and 2017 has already witnessed more three serious disasters claiming over 20 lives among several others. Illegal mining doesn’t just occupy the front pages of our newspapers or headlines of our news portals; it equally occupies the front-page of our minds as concerned Ghanaians generally. Illegal mining has wreaked massive havoc on our lives and environment than natural causes and other human factors such as bad farming practices. Mining is not the problem; even nuclear weapons can be controlled and managed. There is poor management of the galamsey menace due to lack in the enforcement of environmental laws especially by EPA and the Minerals Commission. There is a general lack of education, environmental assessment cost, proper pricing of the minerals. Low pricing of our mineral resources reflects a general lack of generational thinking and cost benefit analysis. The pricing index should factor the environmental cost, opportunity cost to agriculture, human settlement, health hazards, and pollution of water bodies and destruction of aquatic life as well as cost to unborn generations. Where is the roadmap after the six month reprieve? On April 17, 2017, Hon. John Peter Amewu launched the Multilateral Mining Integrated Project (MMIP) at Kwahu-Mpraeso to holistically tackle the menace of illegal mining and to bring sanity. It was a three-prong approach including provision of law, enforcement and technology to ensure transparency and sustainability. In conjunction with the Minerals Commission of Ghana, it was conceived as a five year project seeking to involve all Ghanaians and stakeholders in the mining sector. Under which, it was promised that, alternative livelihood involving cultivation of oil palm plantations at Prestea-Huni Valley and Dunkwa for galamseyers. So far, the government has been dodgy in coming out with information on the management of the menace. There should be more education and sensitization of the citizenry on the dangers associated with illegal mining including the use of mercury and cyanide. More education should be given to the local people involved especially on radio, TV, print media, schools, colleges, universities, churches, mosques and local communities. The dangers associated with galamsey should be highlighted and amplified. The Rambo style approach is a nonstarter. The people must see the need to safeguard their own environment and generations unborn. Already allegations of bribery and corruption are rife in the operations of Operation Vanguard across the country. Local authorities and people should lead the way. Communal responsibility is key to fighting illegal mining and other illegal activities like lumbering, overgrazing by Fulani herdsmen and sand winning effectively. We should get the local people involved if we are to succeed in dealing with the menace permanently. If local authorities and people who used to be the safeguards and defenders of their own lands and resources are today selling off and looting same, then all Ghanaians should feel threatened. There should be provision of alternative sources of livelihood to absorb all the people whose lives depend solely on mining. Until this is done every effort and commitment from government and stakeholders would be ad hoc and lame. Government should have more engagements with the local people and find alluring employment packages like youth in agriculture and local industrialization. ‘Planting for Food and Jobs and One District, One Factory should provide the answers here. There is a dire need for mutual commitment from all quarters to stop the menace across Ghana by all stakeholders including central government, parliament, local government authorities, security agencies, traditional and religious leaders and civil society organizations, professional bodies, NGOs, the media and most importantly all Ghanaians. There must be reliable sources of funding for the integrated efforts aimed at curbing the menace across board. Those caught perpetrating illegality in mining especially should be charged heavily and the funds set aside to finance the deployment of the security forces to safeguard our land, forests and water bodies in the meantime. Government must regulate the importation and in due course criminalize the distribution and sale of toxic chemicals like mercury, lead and cadmium and heavy duty machinery like the excavators, Chang fans and dredgers among others. There should be a massive reform the licensing framework and regime by Minerals Commission, Environmental Protection Agency and the Ministry of Lands and Natural Resources to make it easier for people to obtain license for operations so that their activities could be monitored, checked and regulated with ease. Foreign involvement and investment especially by the Chinese should be dealt a lasting blow. No foreign involvement whatsoever should be the rule and mantra. Mining in Ghana should be owned, done and controlled by Ghanaians and Ghanaians alone. Issues regarding mining should be divorced from politics and political expediency. Politicians often bow to pressure from voters from mining areas and their desire to satisfy illegal miners in order to win votes and political leaders’ involvement and interest in mining make the fight an uphill task. Government must criminalize the ownership and use of Chang fans, excavators and dredgers in mining by galamseyers along water bodies. Alluvial mining should be banned forthright without further delay. Licensed mining companies should be made responsible for the closure and securing abandoned sites or suffer heavy fines otherwise the fight against mining will be fruitless in the long run. Investors, landowners, illegal miners and collaborators should all be dealt with in the fight against the galamsey menace. Use of brutal force doesn’t work because of local informants and bribery. All should come on board perpetrators, political, religious and traditional leaders and the people. There are enough existing structures, bylaws and regulations, what is left to be seen and done is strict enforcement and application of the law. No need for reinvented laws. There should be strict enforcement of the law on mining activities without fear or favour. Honest, firm and fair leadership, no double standards. Finally, my greatest fear as a Ghanaian is that mining concessions at the end of the day would go to the highest bidder, mostly foreign owned companies. Bigger and multinational mining firms must strictly apply the local content law passed in 2013. Identification of the problem (dangers and challenges associated with the menace) leading to suggested and proffered solutions, then to the best way out (lasting solutions). The next stage involves implementation of the best way forward (execution) or plan of action followed by assessment of the implementation process then finally termination or repetition of the entire process to achieve sustainability and eradication. Next: Nana aba – paradise regained or paradise lost?